The new football coach for the University of California, Berkeley promised on Thursday to "turn this program around." In a press conference introducing him to the Bay Area, Sonny Dykes said "we will put the ball in the air. Our brand of football is fun. That's what's exciting for the fans out there." Dykes, who coached Louisiana Tech University, acknowledged that the team there was strong in offense but weak in defense in its last season. "The defensive coordinator will be the most important hire I make," he said. He pointed out that Louisiana Tech had a strong defensive record prior to last season. 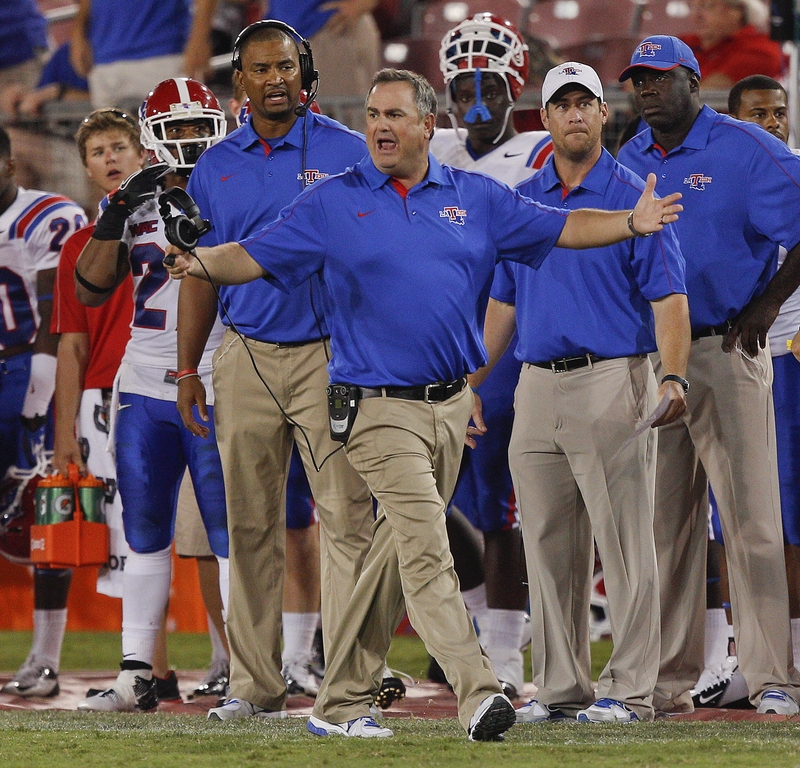 BERKELEY, Calif. (AP) — California hired Louisiana Tech coach Sonny Dykes on Wednesday in hopes that the offensive mastermind can revive a program that struggled in recent years under the fired Jeff Tedford. Athletic director Sandy Barbour made her biggest hire at Cal just more than two weeks after firing Tedford. Dykes will be formally introduced at an on-campus news conference Thursday. "Sonny Dykes is one of the brightest offensive minds in the country, running a high-octane style of football, one that I'm certain will allow our student-athletes to thrive and that our community will love on game day," Barbour said in a statement. "However, it was far more than his history of a top-ranked offense and his proven success on the football field that solidified my decision; it was the way he described his responsibility to the University at large and his commitment to creating a climate of comprehensive excellence and success for his student-athletes." The 43-year-old Dykes had a 22-15 record with the Bulldogs, improving their win total each year. The Bulldogs averaged 35.9 points and 452.5 yards per game in his tenure. He takes over a Cal team that went 3-9 this past season and missed a bowl for the second time in three years. Dykes inherits a roster with some talent, most notably heralded quarterback recruit Zach Kline, who did not play as a freshman but is in line to win the starting job next season. Dykes also will benefit from a facilities upgrade that Tedford helped engineer. Cal opened its remodeled $321 million stadium this past season that is adjacent to a $150 million on-campus High Performance Center. "Cal offers one of the best combinations of athletics and academics in the country, and a passionate fan base to match," Dykes said. "I'm looking forward bring our exciting and enthusiastic brand of football to Berkeley. Our objectives are numerous. In addition to winning football games, we will strive to develop the total student-athlete in the classroom, on the field of play and in the campus and local communities." The Bears will be without standout receiver Keenan Allen, who announced earlier in the day that he will skip his senior season to enter the NFL draft. Allen is Cal's career receiving leader and is expected to be one of the top receivers taken in next April's draft. Tedford, once known as a quarterback guru for his work with Joey Harrington, Kyle Boller and Aaron Rodgers, struggled in his later years at Cal to find an elite passer. The Bears had a 34-37 record in Tedford's final 5½ years, leading to his dismissal. Dykes, the son of former Texas Tech coach Spike Dykes, is known as an offensive mastermind, who runs a spread system that he honed as coordinator under Mike Leach at Texas Tech. 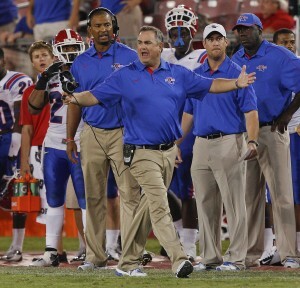 Dykes later spent three seasons as offensive coordinator at Arizona under Mike Stoops before becoming head coach at Louisiana Tech before the 2010 season. He also coached two years as an assistant at Kentucky. Dykes coached one of the nation's most prolific offenses at Louisiana Tech this year with the Bulldogs leading the nation with 51.5 points per contest and ranking second with 577.9 yards per game. They opened 9-1, losing only 59-57 to Texas A&M, and were in position possibly to make it into a BCS bowl. But Louisiana Tech lost the final two games of the regular season to Utah State and San Jose State and now won't even play in any bowl. La Tech was offered a spot in the Independence Bowl last Saturday but wanted to wait before accepting in case they got a better bid. The Independence Bowl invited Ohio instead and the Bulldogs were left out when Northern Illinois got into the Orange Bowl, knocking Oklahoma out of the BCS. Oklahoma State (7-5) then filled the Big 12's final spot in the Heart of Dallas Bowl against Purdue, while Iowa State (6-6) landed in the Liberty Bowl to play C-USA champion Tulsa as an at-large pick and the Bulldogs were left out. "We want to thank him and his family for the past three years and wish them the best in the future," Louisiana Tech athletic director Bruce Van De Velde said in a statement. "We will move meticulously and expeditiously in our search for our next head coach." There was no immediate word on the terms of Dykes' contract. Cal still owes Tedford $6.9 million over the final three years of his deal, although Barbour had said the sides were working on a settlement.